Earlier this month Mary Kay, in partnership with their Don’t Look Away Campaign, released the results from their first, national Don’t Look Away survey. They polled parents of 11-18 year old girls, and found a large difference between parents’ beliefs about and the realities of their daughters’ relationships. 1 in 3 adolescent girls in the United States has experienced physical, emotional, or verbal abuse from a romantic partner. One of the most important tools parents have is communication. 83 percent have discussed their daughters’ right to say no and how to do so. 73 percent have discussed that dating abuse can be physical, emotional and/or sexual. 66 percent have discussed where to get help should she or a friend ever encounter dating abuse. 60 percent have discussed the warning signs of dating abuse. 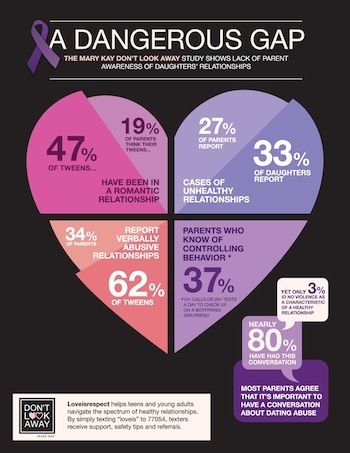 With a 28% disparity in the percentage of parents who believe their teens have been involved in a romantic relationship (19 percent) and the actual percentage of teens who have taken this step (47 percent), it is clear that some parents are starting this discussion too late.Also concerning in the results was the fact that only 3 percent of parents specifically identified “no violence or abuse” as a characteristic of a healthy relationship. It is important that parents talk to their teens, not only about dating violence and abuse, but also about the differences between healthy and unhealthy relationships. Verbal Abuse – yelling, name calling, ridiculing, threatening violence. Emotional Abuse – manipulation, constant criticism, humiliation. Physical Abuse – slapping, pinching, hitting, kicking, shoving. Lack of Privacy – a partner demands passwords to social media accounts, email, or phone, and checks them without permission. Calling or texting excessively to check up on a partner. Limiting a partner’s time with family and friends, or activities outside of the relationship. Good Communication – partners share feelings and opinions openly and honestly, and conflicts are solved without violence. Mutual Respect – partners do not belittle or criticize each other; each partners’ individuality and differences are embraced, and their feelings are not minimized. Support – partners encourage each other, and listen without judgement. Privacy – partners are not together at all times, and do not have to share everything. No Violence or Abuse – physical, verbal, and emotional abuse have no place in a healthy relationship. If you are a teen (or parent) who has questions about dating abuse or needs help, the National Teen Dating Abuse Helpline is a 24-hour resource that can be accessed by phone (1-866-331-9474 & 1-866-331-8453 TTY), online at loveisrespect.org, or by texting “loveis” to 77054.